To put it into perspective, Lewis Hamilton's pole position time for last year's British Grand Prix at Silverstone - one minute 25.892 seconds - was 34 seconds faster than the lap record for a grand prix motorcycle. A really quick road car, such as a Ferrari or McLaren supercar, would lap at around that pace, too. How does the F1 car do this? Part of it is an engine that produces close to 1,000bhp. But the difference in lap time is mainly made up of the F1 car's cornering abilities. And the main reason for them is aerodynamics. The manipulation of air around a car is the single biggest performance differentiator in F1 - and collectively the teams employ hundreds of people and spend many millions of pounds on refining it to find that crucial extra bit of speed. Let us start by taking a step back and look at why aerodynamics are so important in F1. The primary aim of aerodynamics is to generate downforce to push the wheels harder into the road, so the tyres give more grip. More grip means faster cornering speeds, harder acceleration and braking - and quicker lap times. To put this into perspective, at 100mph, a modern F1 car will produce roughly 750kg of downforce. Since this is more than the minimum weight limit of the car, this year 743kg, it means it could in theory drive upside down on the ceiling. However, it is not just about piling on as much downforce as possible. An F1 car has to work in a number of different conditions, and it is never a perfect scenario. An F1 car leans to the side when it corners, dips down at the front when it brakes and at the rear when it accelerates - and is often doing two of the three at the same time. And that's just the start of what is going on when it is on the limit on track. The aerodynamics have to provide a consistent and predictable amount of downforce at all times and in all these conditions, without sudden changes one way or another. This takes a great deal of analysis and number crunching using complex computer programmes and simulation in wind tunnels. For the car to perform at its optimum, it is important to have a good balance between how much the car pushes down on the front wheels, and how much it pushes down at the rear. If the aerodynamics don't push down enough on the front, the car won't turn into the corner. This is known as understeer. If you neglect the back of the car, then the rear wheels will slide and the driver will soon find himself pointing in the wrong direction. This is oversteer. Why do the cars look different this year? You often hear complaints that F1 cars all look the same. This is because, to keep performance under control, the regulations are very prescriptive and there are only certain areas in which designers can innovate. But to the trained eye, there are key - and often fundamental - differences between the cars. These explain why one car is faster than another. For this year, the FIA, the governing body, has changed the rules on front wings. The idea behind the move was to enable cars to follow each other more closely in order to increase overtaking. The way they have done this is to reduce the freedom to design parts that manipulate the airflow. This would have cost downforce at the front of the car, so they also made the front wings 20cm wider to make up for that. The changes mean teams have lost a lot of our ability to control one of the biggest problems for an F1 designer - the air coming off the front tyres. This churning, turbulent air is a bit like the wake you might see behind a boat, and it's a problem for aerodynamicists because it's difficult to generate downforce from. The messier the airflow, the harder it is for us to make it do what we want. To solve this problem, last year we would use the airflow off the front wing to kick the tyre wake as far out and away from the car as possible. Now, because of the restrictions on devices to control the airflow that we can put on the front wing, all that's changed and, frankly, we're not yet sure what is the best thing to do. How are teams solving this problem? Looking at the cars this season, you can see that the approaches to this problem largely fall into two camps. We call these 'outboard-loaded' and 'inboard loaded'. Those names refer to the point on the front wing on which the most downforce is exerted, and consequently where the airflow is being directed. 'Outboard' means at the outside edge; 'inboard' towards the middle. What makes things particularly interesting is that Mercedes and Ferrari have opposite styles. Mercedes have gone for 'outboard'. Their car has the highest and steepest bits of the wing at the outside tips, where the flaps meet what is called the end-plate, the vertical structure at the outside of the wing. This generates suction, or low pressure, outboard. Air from the middle of the car will travel towards this area of low pressure. We call this style 'out-washing' - ie, it sends air outwards, away from the car, in an attempt to control the tyre wake. The Ferrari approach is more loaded in the middle of the wing and quite unloaded at the tips - on the wing, you can see that the highest point of the flaps is at their inside edge, and they slope downwards towards the outside of the car. This draws air towards the centre and results in an 'in-washing' air flow. Why might Ferrari's philosophy work well? One advantage of reducing the download at the tips of the wing - what we call 'backing-out' the tips - is that airflow structures generated there will be much less stressed. I'll have to explain what that means before I go on to say why it could be a benefit. Bear with me - we're heading into the complexities of aerodynamic theory for a moment. Air near the surface of a wing, what we call the "boundary layer", likes to travel towards low pressure, which speeds it up, but does not like having to go back into high pressure, which will slow it down. The air will only put up with a certain amount of speeding up and slowing down before eventually it gets too stressed and won't hang on to the surface any more. Once this happens you have what we call "stall". Instead of a nice, clean, downforce-generating wing, you just end up with a load of wake, or "dirty air" - and much less downforce. Actually, the wings themselves don't give us much of a problem - all the slots between the flaps help us out there. It's the end-plate which is tricky. Because the rules mean we're pretty much stuck with a big flat plate, with very little curvature to help the air, all you can do is reduce the amount of speeding up and slowing down the air at the surface has to do - by 'backing-out' the tips. There are two potential advantages to Ferrari's approach. The first is that the reduced tendency to stall might produce a car that is more predictable to drive. And the more predictable a car is, the greater the driver's confidence. For this reason, quite often, a more predictable car with more consistent downforce but slightly less maximum load will end up being quicker than a car that in theory has more downforce but that which cannot generate the maximum load consistently. That's because the inherent nervousness of the 'peaky' approach means the driver does not have the confidence to push to the limit, as he fears he might lose control. In addition, the vortices - little tornadoes of spinning air - which are generated at the end-plate and which are so crucial to a car's overall performance can be drawn inside the tyre to help control the wake. Where might Ferrari go wrong? Looking at the performance of cars from testing - always a fool's errand but bear with me - you might conclude that the Ferrari-style front wing is doing the better job. The Ferrari appears the quickest car at the moment. However, because of the need to back out the ends of the wing so much, it is always going to struggle to match the Mercedes style for absolute load. Remember how we need to have a good balance of front and rear downforce? Well, as the teams develop through the season, putting on more and more downforce at the back of the car, Ferrari might struggle to balance it out at the front. If so, that would give them a car hamstrung with understeer which just won't turn into the corners. On the Ferrari, there are already clues that they might be trying to compensate elsewhere for a lack of downforce generated from the front wing. The area beside the driver, at the front of the sidepods, around what we call in F1 the 'barge boards', can produce a lot of downforce. The barge boards are the curved pieces that jut out from the main body of the car, and which direct the airflow in ways the designers want it to go. The key with this, though, is that you want to keep as much energy in the air as possible, so as it travels down the car you can use that energy in the diffuser, at the back of the car. Air from the bargeboard area flows under the floor beneath the driver before feeding straight into the diffuser. The faster you can get the air to flow through the diffuser, the lower the pressure under the car and the more downforce it creates, sucking the car on to the track. But lots of manipulation in this area carries the risk of losing energy from the air. Mercedes have reduced the size of their bargeboards this year. This might mean they are generating less downforce at the front of their floor, but it gives them lots of potential to create plenty of downforce at the rear with the diffuser. By contrast, Ferrari's bargeboards have got bigger this year. This could be because they need to make up the front downforce which their front wing can't create. But it could well limit the ability of their diffuser to do its thing. In this way, Ferrari's philosophy could not only give them problems balancing the car front to rear as the season progresses, but also limit the amount of total downforce it can create. Ferrari might not be facing any problems now, and they certainly look to have started the year with a quick car. 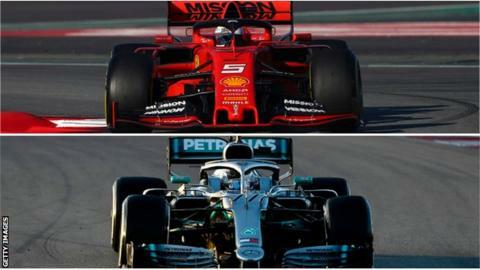 But as the season goes on, I wouldn't be surprised to see Mercedes out-develop them, while the Scuderia find themselves stuck down a blind alley.